There are many ways one can select a stock for trading or investing. Some may use purely technical criteria; some may mix derivative and fundamental criteria along with technical analysis to select stocks for trading. 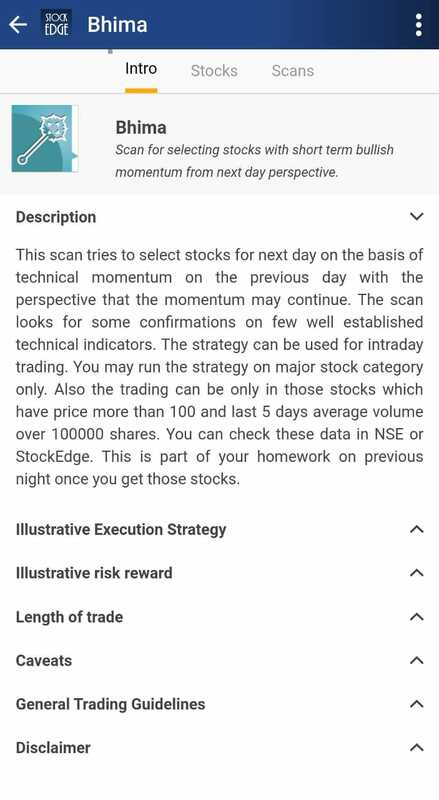 In the Stockedge app you can find more than 200 such individual criteria and in the combination scan section, you can combine a few of them to create your custom stock selection criteria. 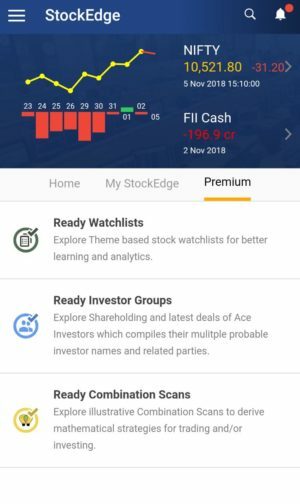 Our in-house research team at Stockedge has created many such strategies and front-tested them over many months and in the ready combination scan section, we have listed few of them which came out with best results over the period of testing. We continue to work on more strategies and look forward to enriching this section in the coming days. 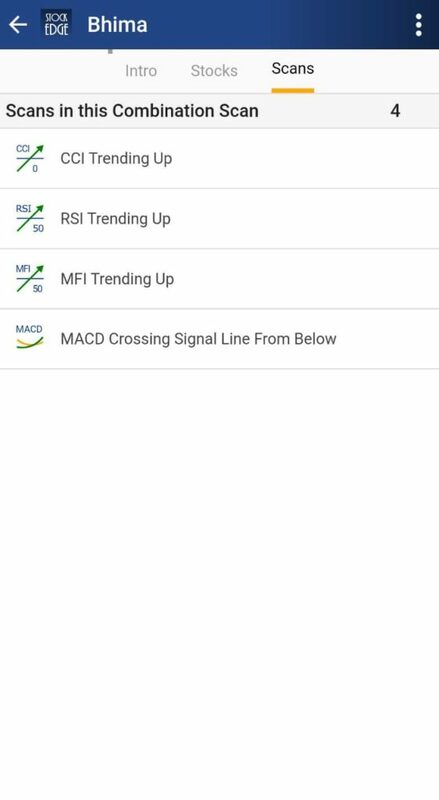 When you open the StockEdge app, the home page will automatically open up. Click on the Premium tab and open “Ready Combination Scans” to see various ready technical scans. Under the “Ready Combination Scan”, there are four broad categories based on Intraday and Swing bullish and bearish view. 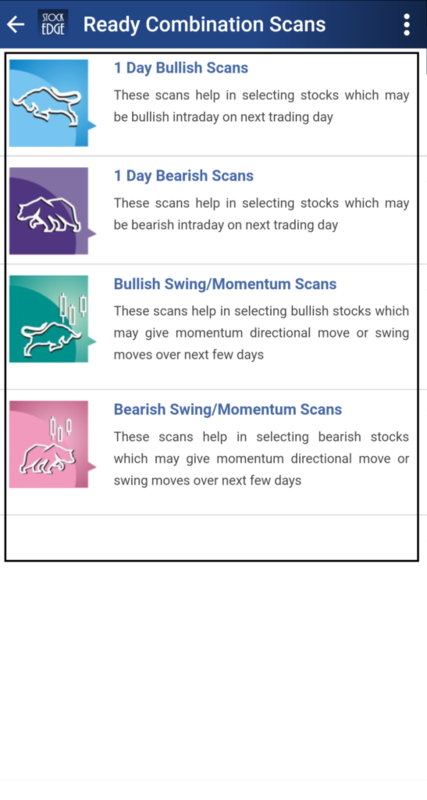 Depending upon your style of approaching the market and time frame, you may look for intraday and swing scans. Say you click on the first option- “1 Day Bullish Scan”, which is a bullish intraday scan. You have a number of intraday scans based on the combination of different technical parameters. Let’s look into one of the scans and discuss it. When you click on the first scan which is “Bhima”, you get the following three sub tabs as you can see in the below picture. Further, you can click on Stocks to get a list of shares which fulfil the Criteria set in Bhima Scan. 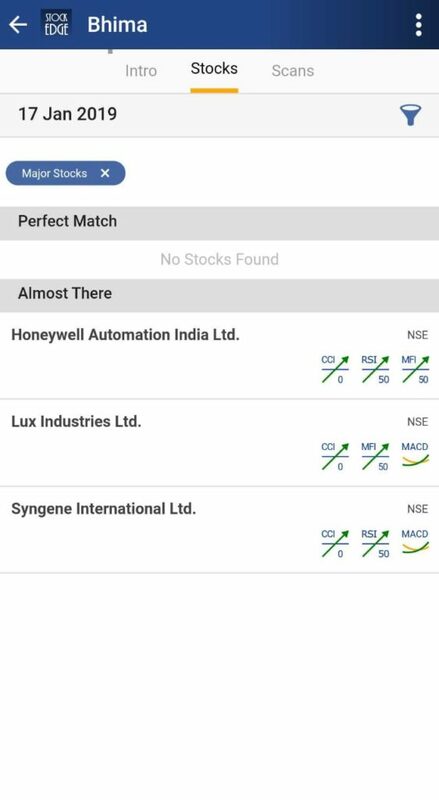 Stocks under Perfect Match are the stocks which fulfil 100% criteria. While Stocks in Almost there are the ones which fulfil 75% of the criteria. Similarly, you may select other scans based upon your trading style whether intraday or swing. The first sub-tab talks about basic guidelines in general about the intraday scan which includes execution criteria, risk-reward, length of trade etc. The buy side intraday position will be taken only above the high of first 15 minutes candle. Intraday target will be 1.5% from the entry; keeping 1% as a stop loss. The buy position will be taken only if the price breaks the high of first 15 minutes candle before 1 p.m.
Every day at 2:30 pm one may put cost price as SL for trades which are in profit and may look to square off between 3-3:15 pm. If there are any major global events like Brexit poll or US Presidential election. 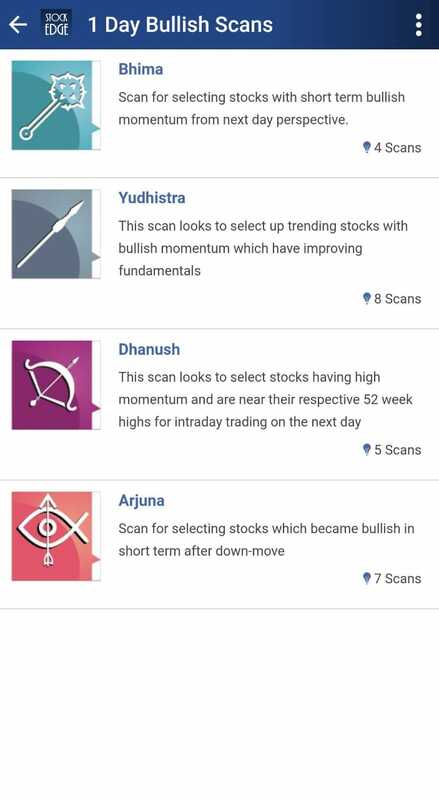 More such guidelines are mentioned in General Trading Guidelines in “Intro” sub tab of the respective scans. The best part of using combination scan is that you do not need to hunt for stocks in an arbitrary manner and moreover following the guidelines helps you to maintain discipline. With risk-reward of about 1.5:1 will fetch you profit even if you are right with 50% of your trades. Also, we want to mention here that these scans are not any way recommendation from team StockEdge for trading and investing. We have experimented with some rules and just put forward the strategies that we found good over time. It may very well happen that the market dynamics and volatility may change and these combination scans may cease to provide great results. We recommend you to experiment with your own strategies and try to improve them over time. Disclaimer: These are only suggestive technical rules that have been found to work well over time in the market. These are not any trading or investing recommendations. We suggest you to take advice from certified experts for trading and investing. Neither StockEdge nor any of its associates are responsible for any trading or investing loss.